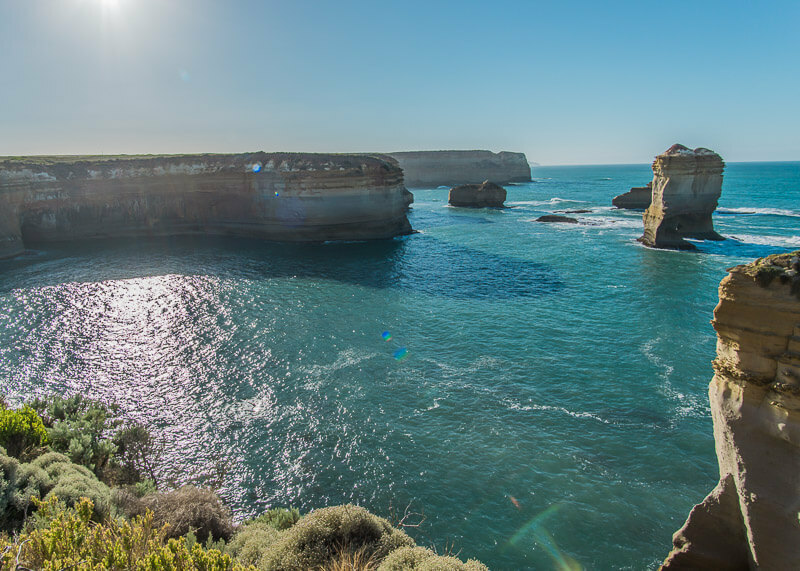 Great Ocean Road Tour from Melbourne is a must when you visit Australia! 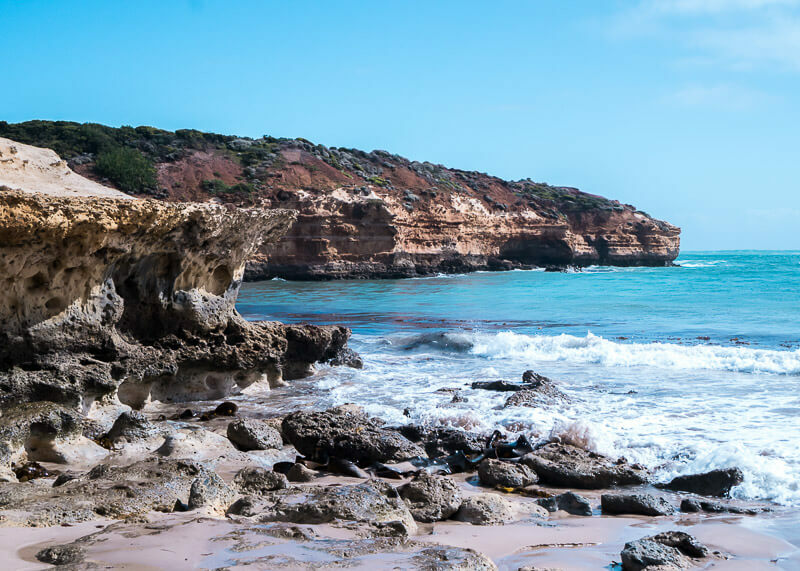 So you’ve decided you want to take a tour of one of the best road trips in Australia (and maybe in the world?). Ok, that’s the easy part. Now, how do you decide which of the gazillion tour groups that you see online to book? Talk about the paradox of choice. 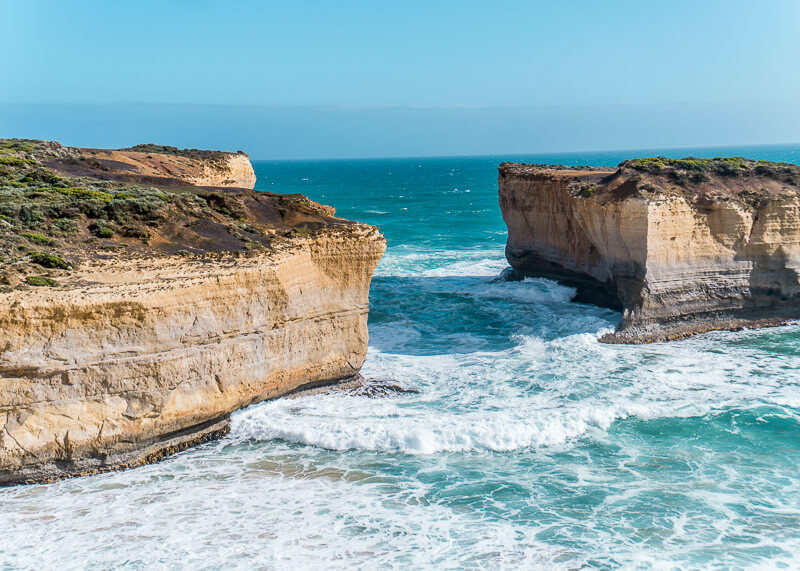 I mean, all it takes is a quick google search of Great Ocean Road tours, and you can feel the overwhelm of all the information that is thrown your way. And after reading the first ten searches on Google, they will all start to look a bit same same…but different. I hear ya. I was once in your shoes. 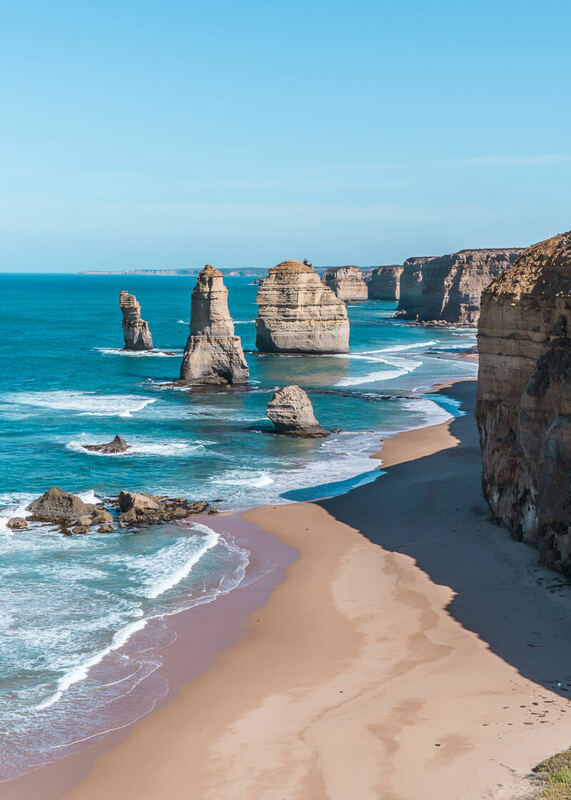 Do a quick search on Great Ocean Road tours from Melbourne and prepared to be overwhelmed with a gazillion tour choices to make. I get where you are coming from because I was once there before I finally decided on a tour company. 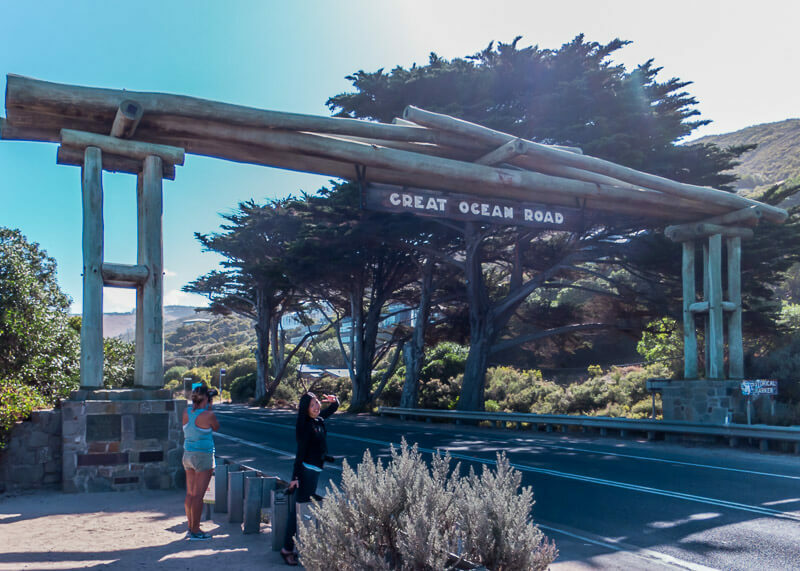 For that reason, I have written a super detailed guide to help you choose the best Great Ocean Road tour for you. 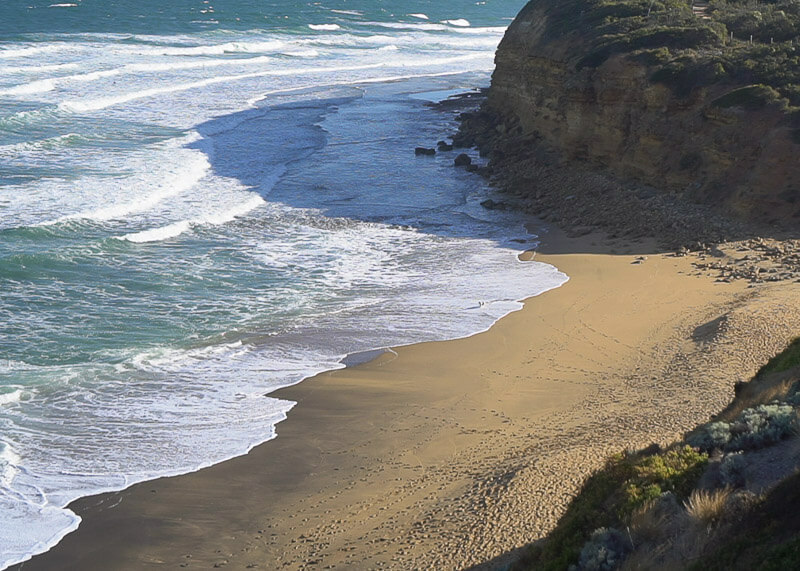 The Great Ocean Road is about 250 km (150 miles) from Melbourne. 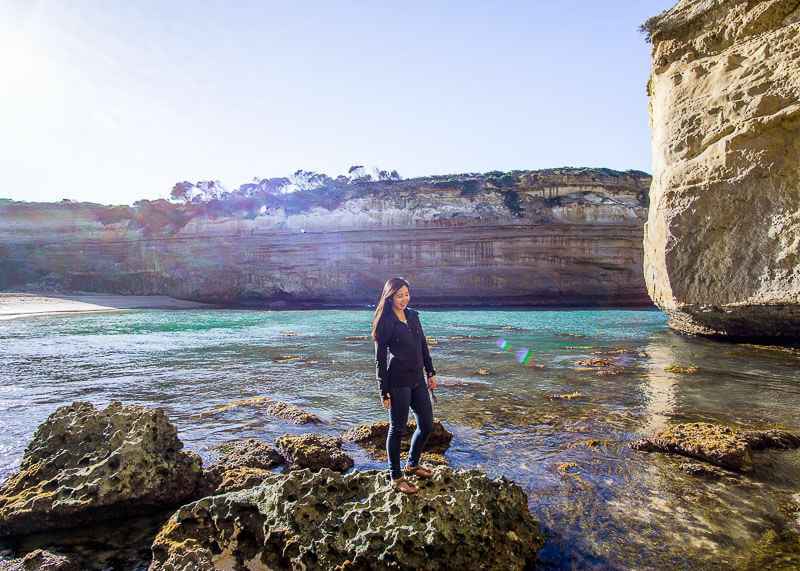 The most popular way to see the Great Ocean Road is either by tour bus or self-drive. What is the cost of the trip and what is included in the price? Which meals are covered? What about park entrance fees and accommodations? How long do I want to go for and what’s an ideal time frame? 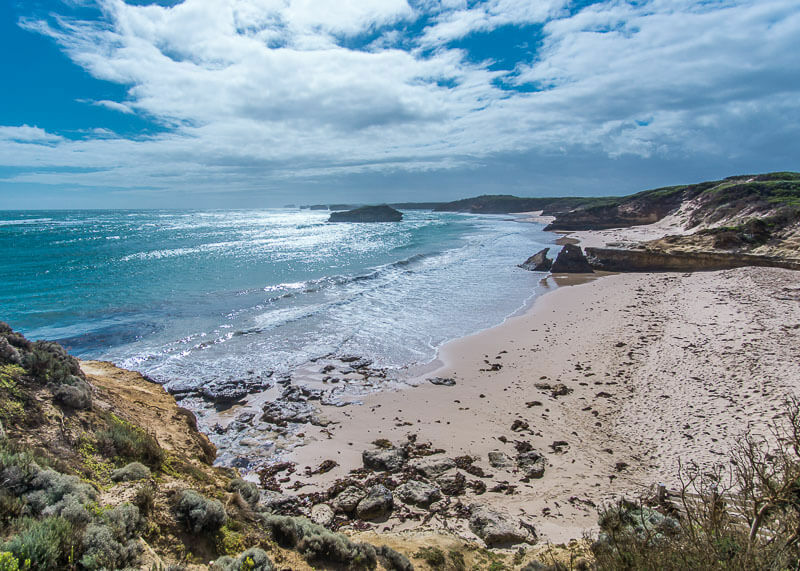 There are so many different tours offered for the Great Ocean Road. Some range from one day while others are multi-day trips. 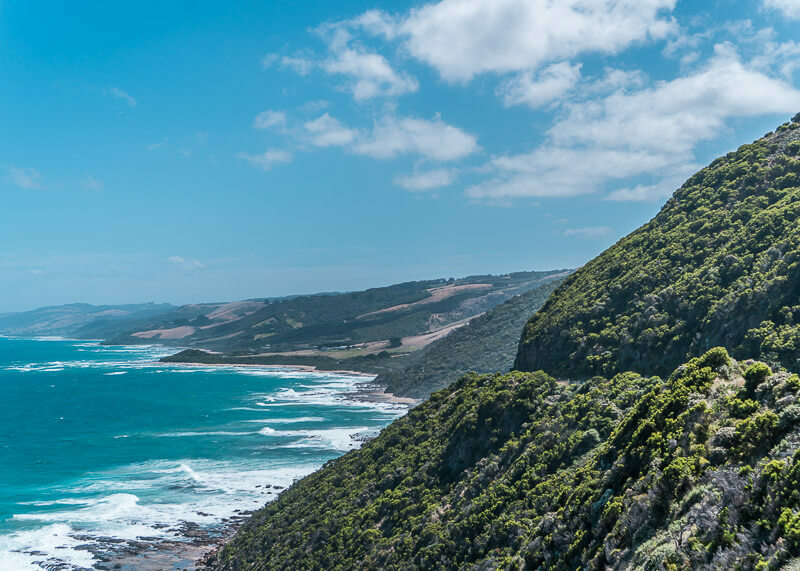 In my opinion, the sights and stops of the Great Ocean Road are not one to be rushed, and I would spend at least two nights on the Great Ocean Road. I only went for one night and felt some parts were rushed due to schedule restrictions. 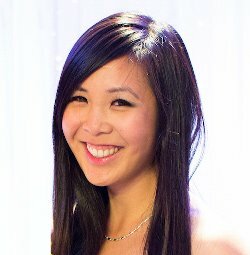 What’s my travel style and what type of accommodation am I staying (if overnight)? Most tour packages seem to offer room upgrades. I.e. 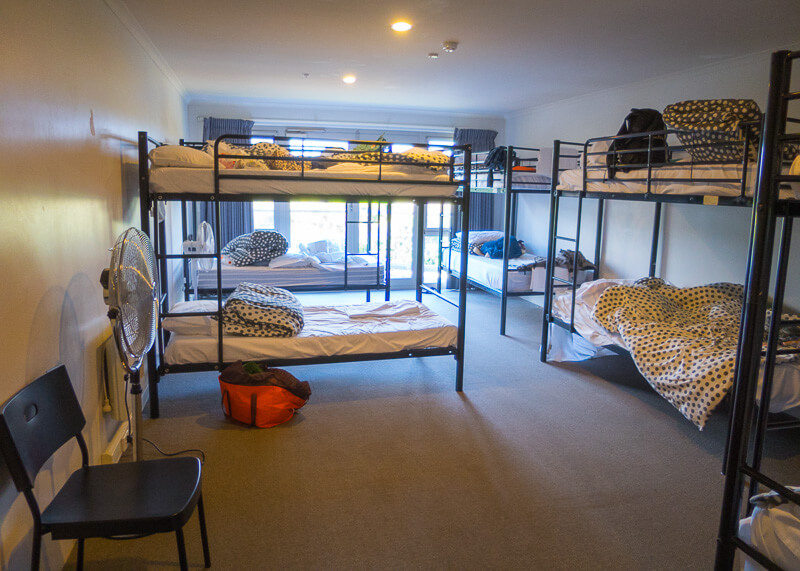 you might find that your tour group is staying at a hostel, but you can still book a private room. Do I care about seeing wildlife? 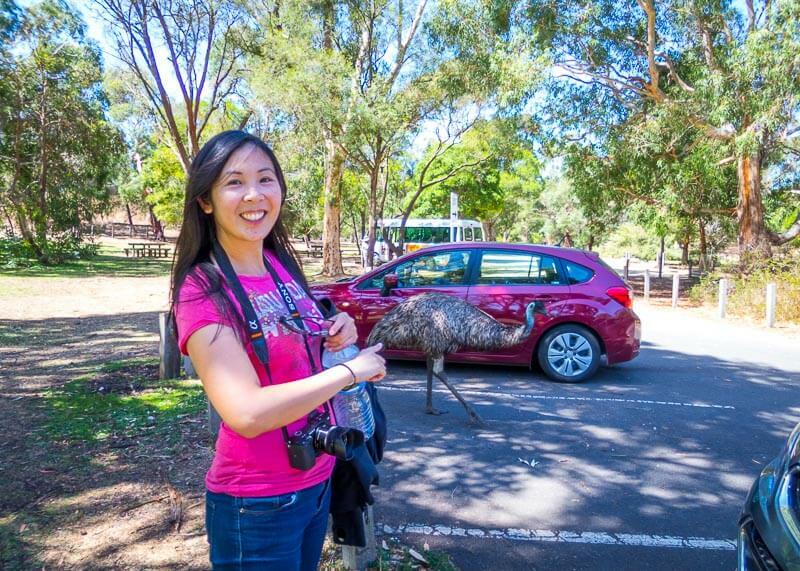 Don’t be surprised if you see an emu pass by you! 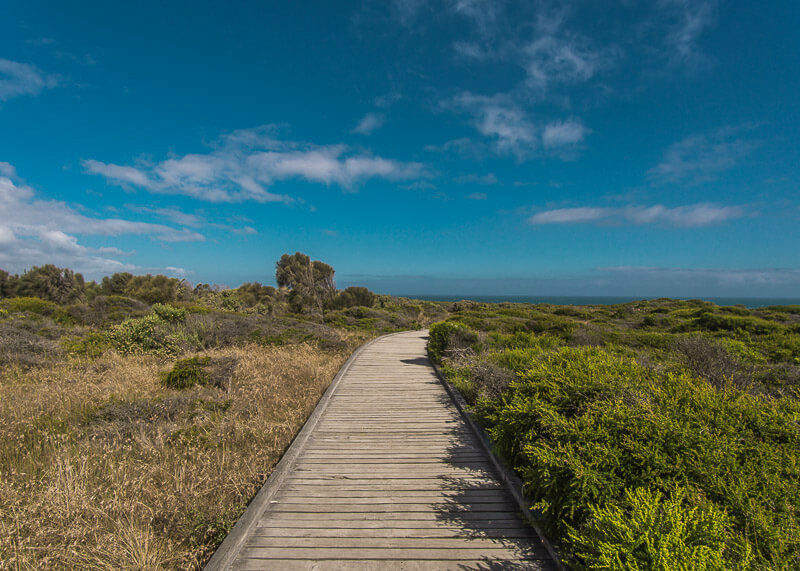 There are certain parks and specific times to see wildlife like koala bears and kangaroos in their natural habitat. If seeing these animals in the wild are essential to you, make sure to read through the itinerary to see if you’ll find wildlife. 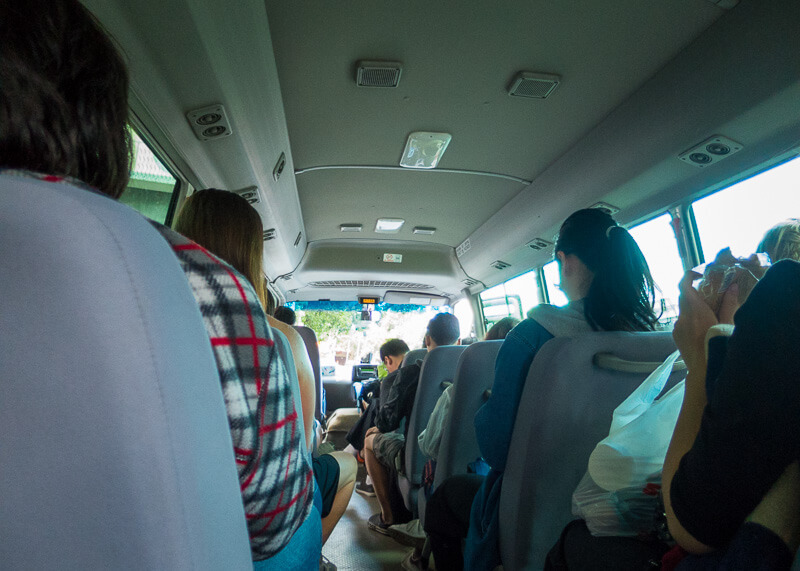 Make sure to ask specific questions to the tour company, so you know what to expect. Some tours will not allow you to bring too much stuff due to space limitations. For example, my tour only allowed one small overnight bag per person. Luckily, we were able to leave our ginormous suitcase at our Melbourne hotel. If it is an overnight tour, where will I stay? 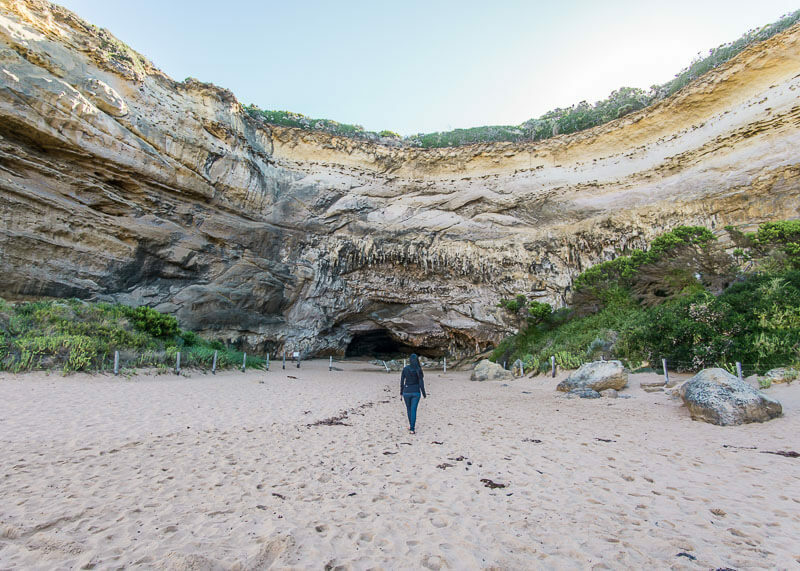 The tour I used for the Great Ocean Road booked us in a hostel. Note that I am NOT a hostel person and thought that I was able to book a private room. That was not the case at all since they all were booked up pretty quickly. What are my must-dos? What time will we be visiting my must-dos? 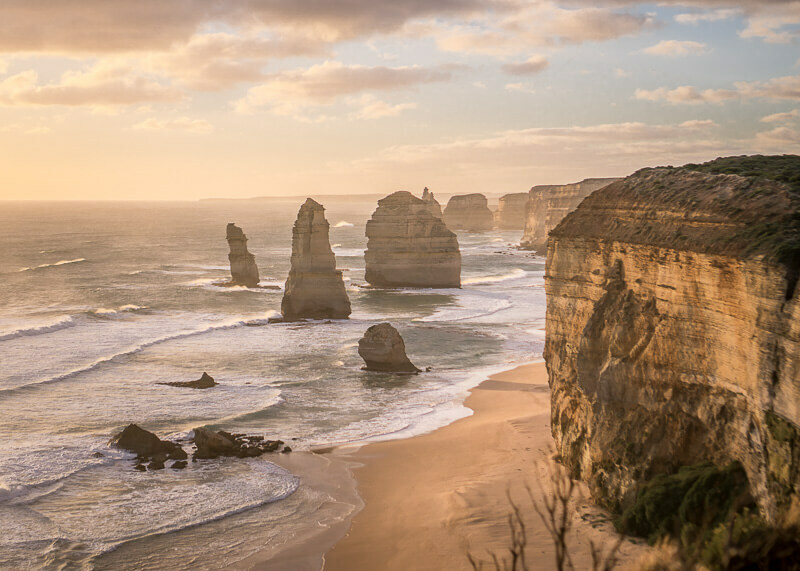 For example, seeing the Twelve Apostles during sunset is a MUST-DO for me. 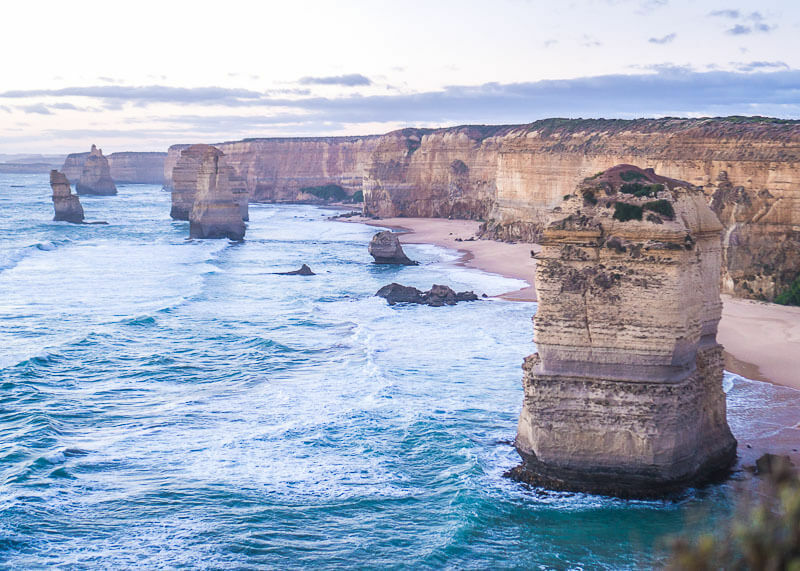 I mean, look at this photo taken during sunset versus seeing the Twelve Apostles during the day. There’s something magical about being in a beautiful place when the sun is about to bid the world a good night. 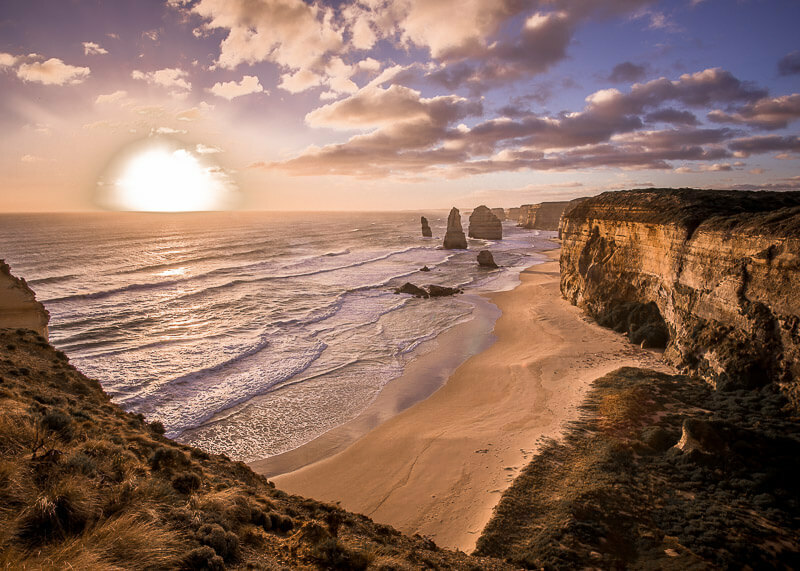 And it’s even more spectacular when you are watching the sunset in a beautiful place like the Twelve Apostles. Who is my tour guide? You may choose a good company, but if you have a crappy tour guide, the chances are that might leave you with a crappy experience. What is the reputation of the tour company I plan to book and other questions to consider? How good is the customer service with the tour group? Finding reviews online will give you an idea of the customer service you can expect when you interact with the company. What is the itinerary for the trip? Is it built to avoid crowds (aka how much do I hate crowds and will go at all cost to avoid them?) Does the tour wake up bright and early to leave and visit all the sights when it is least crowded? Does the tour drive backwards from the traditional loop to avoid the crowds? How big is the tour group? A smaller group means there is a better experience. What is the travel route for the tour? I mention this only because you’ll want to try to find a tour that is doing a reverse route especially during the busy season. Are there extra excursions? 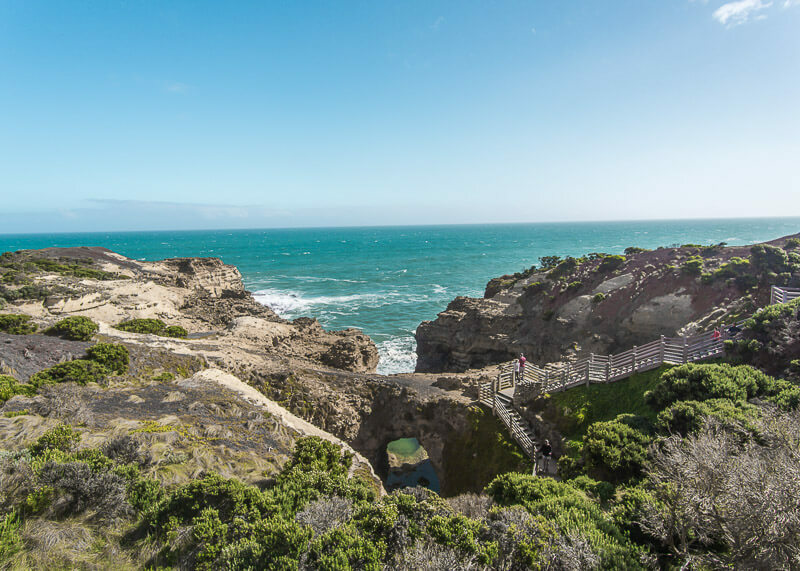 Some tours will offer a helicopter ride over the Twelve Apostles. 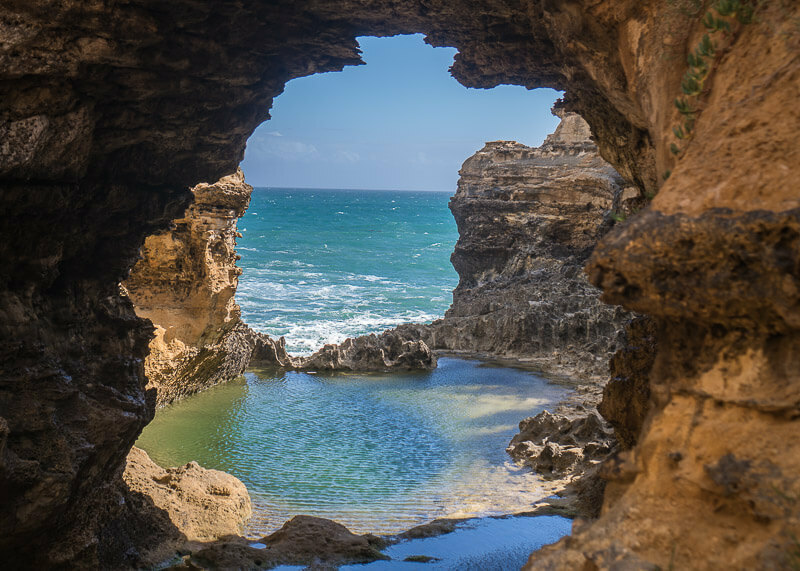 Others include additional hikes or even ziplining. What season am I going? Remember, Australia’s winters are our North American summers. 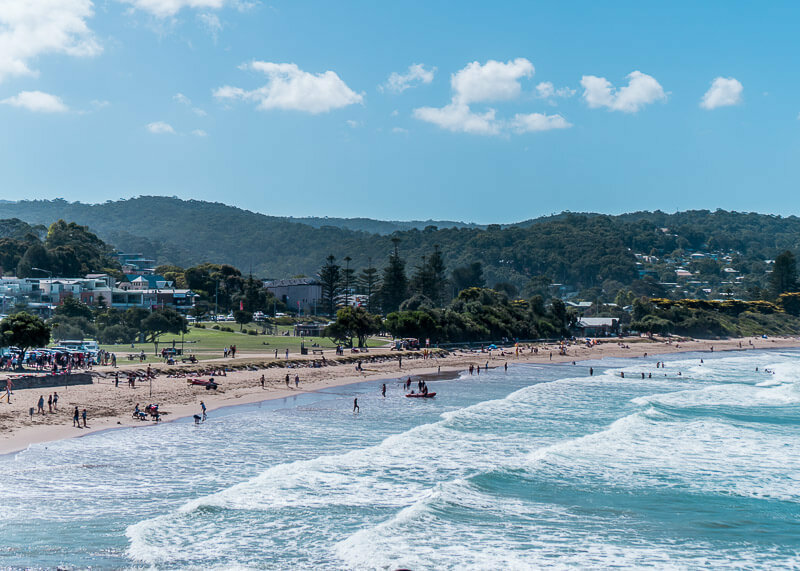 Which means the busy times for activities like the Great Ocean Road is in December and January. Consider going off-season where crowds will be less. Where am I being picked up and dropped off in Melbourne? More important for logistical purposes. What will the vehicle be like and is it clean and comfortable? It’s a minor detail but still something to think about to help you with your trip planning. The last thing you want to do is be stranded on a highway because your vehicle broke down (this happened to me while on a tour). 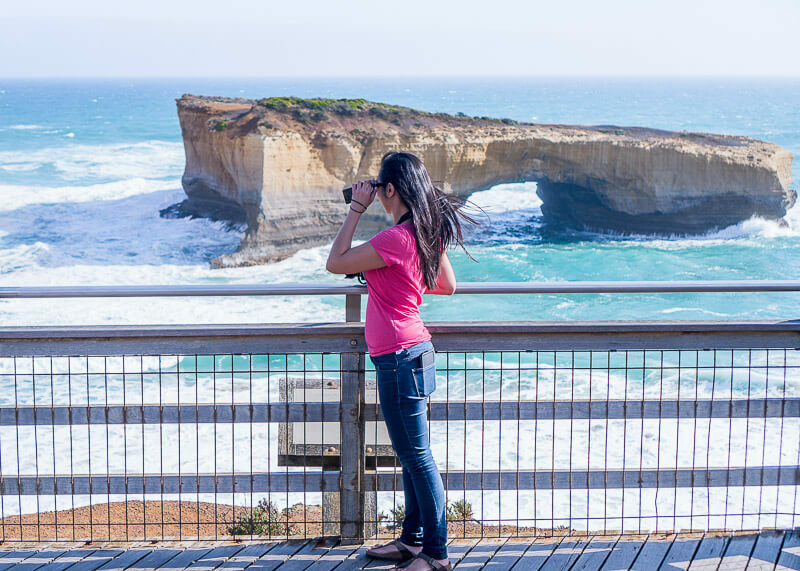 What to bring on the Great Ocean Road tour from Melbourne? 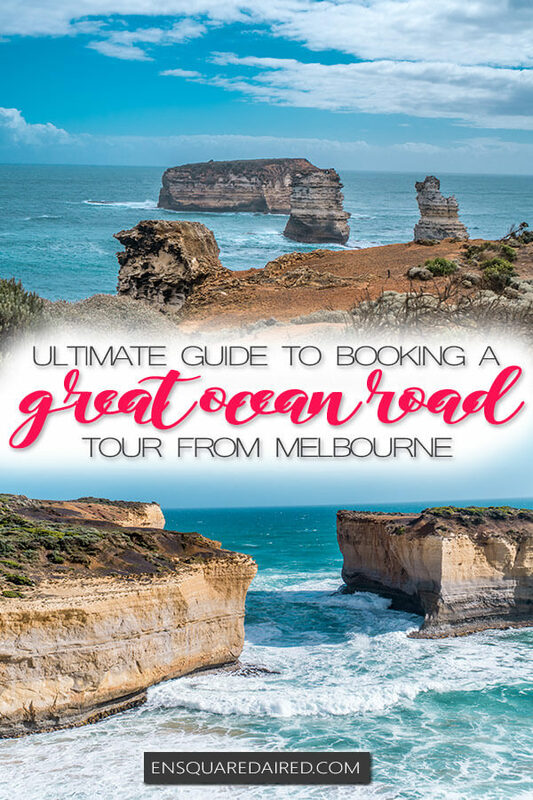 What company did I book with for my Great Ocean Road tour from Melbourne? 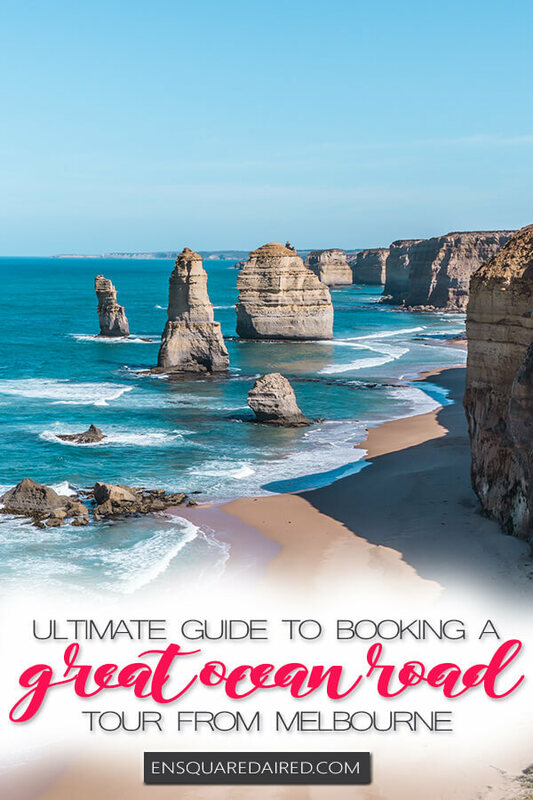 I booked a two-day Great Ocean Road backpacking tour with Sightseeing Tours Australia after narrowing down my criteria. Funny note: I did not realize it was a backpacking tour until the end of the first day of the tour. I am going to share with you the woulda coulda here so that you can consider these thoughts before booking your tour. While my tour guide cannot control when the kangaroos decide to come out to play, I wish we had more time to go kangaroo spotting. We did get to see some on the very last day (I spotted them first!). I also wish I had time to check out Emmett Falls and see cute koalas at Kenneth River. I did manage to see one koala bear at Tower Hill Wildlife Reserve which made me ever so happy. Seeing whales at Logans Beach Whale Watching: Ok, so this is more of a timing thing than anything, but I wish I took the tour during the wintertime. That season is when southern right whales come into the area with their babies. 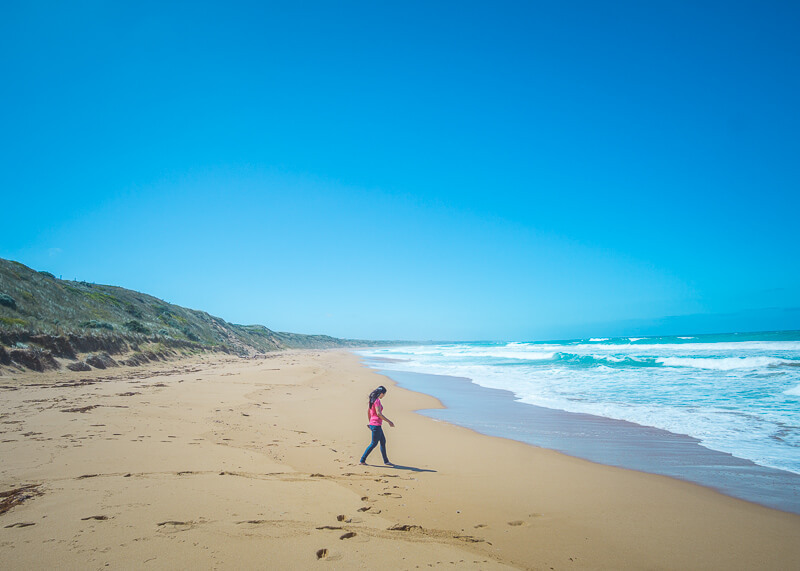 That’s right, the southern right whales use this local beach and come up close to the shore to nurse their babies! How cool is that? 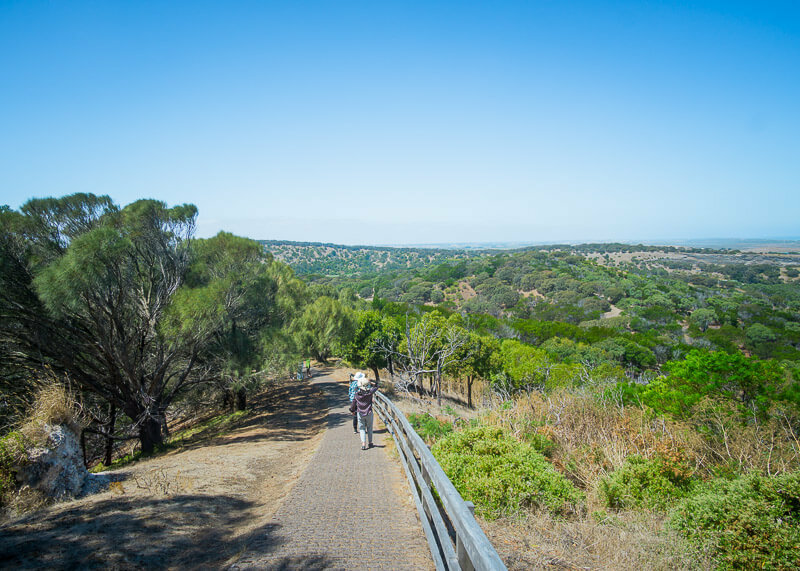 Some tours organize a visit to Chautauqua Peak Loop Walk and visits to the Hollow mountain Phillip Island tour. 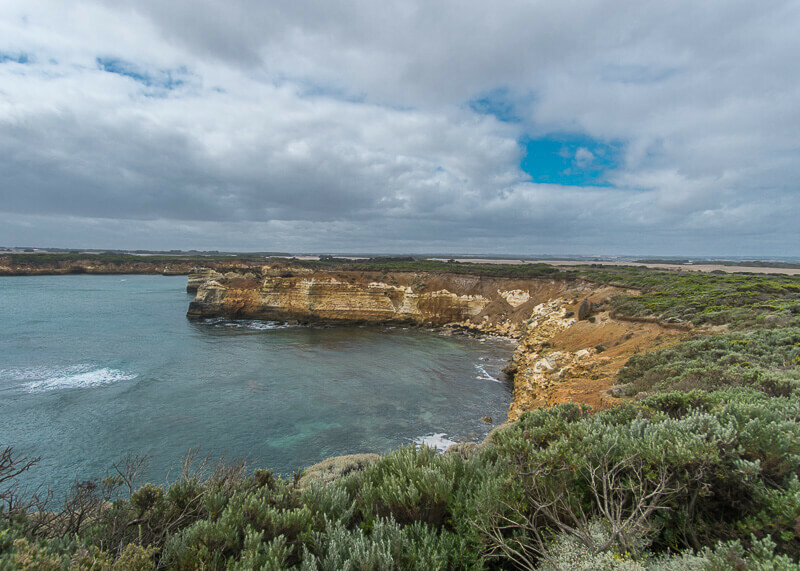 What are some tour companies to start with for research when booking a Great Ocean Road Tour from Melbourne? Note: I recommend you do your due diligence because I have never personally booked with them. 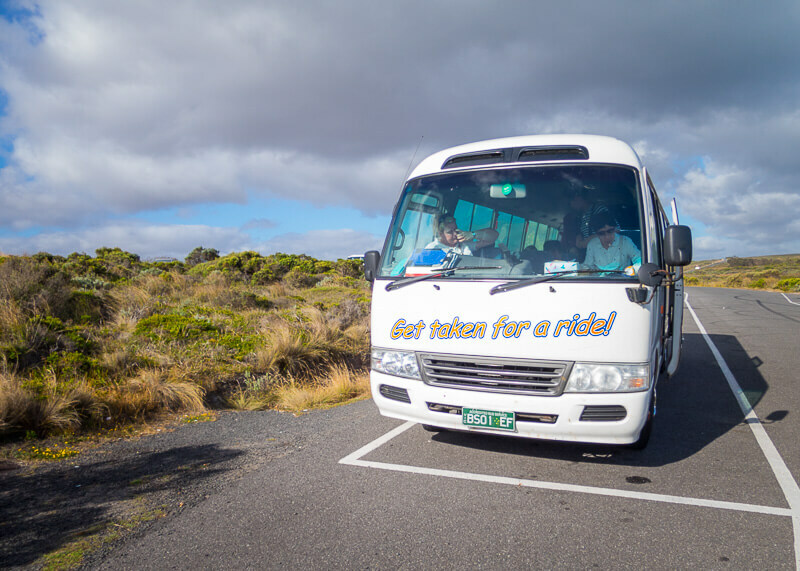 As mentioned earlier, I booked a backpacker’s tour through Sightseeing Tours Australia. If you would like to learn about my experience with this tour company, continue reading below! 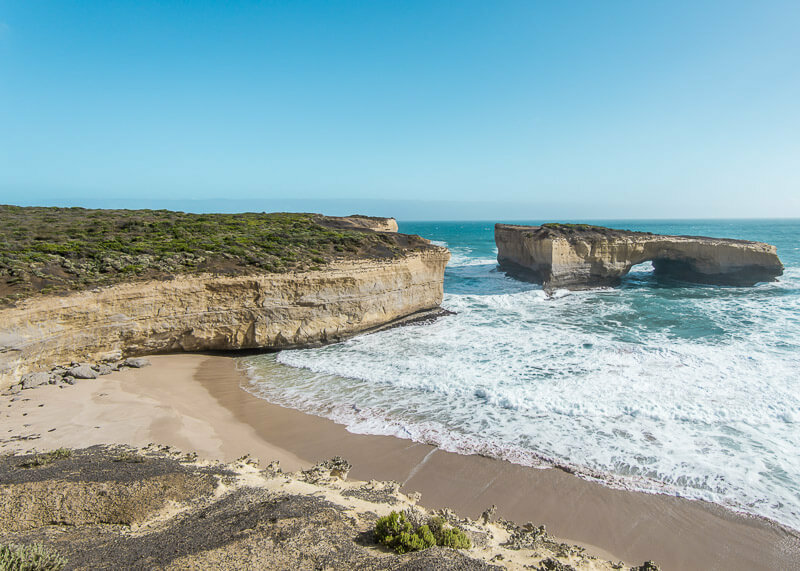 What was the itinerary for the Great Ocean Road tour from Melbourne? 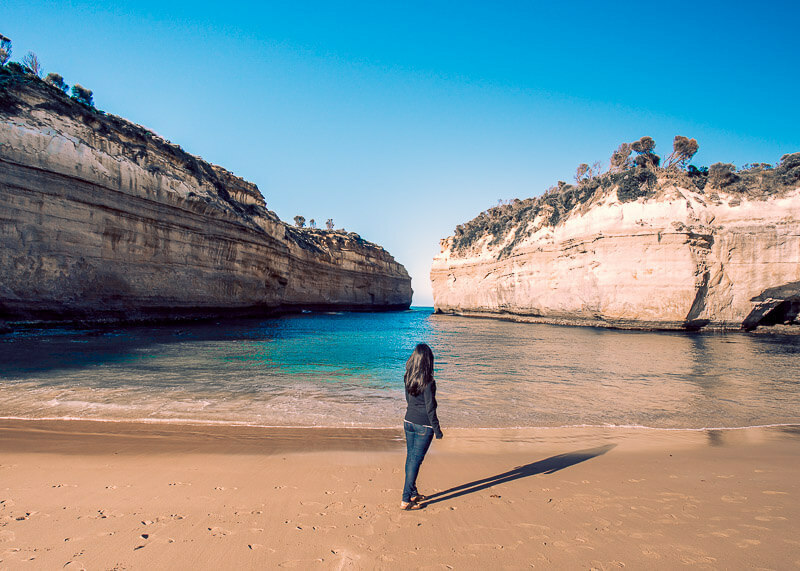 To give you an idea of what to expect on a two-day, one night Great Ocean Road tour from Melbourne, I’m sharing our itinerary. Note, it is a backpacker’s tour, and we had to stay at a hostel (I am SO not a hostel girl in case you are curious). The rest of the trip was fine though, and I enjoyed it. Note: I won’t be going into detail about each stop. 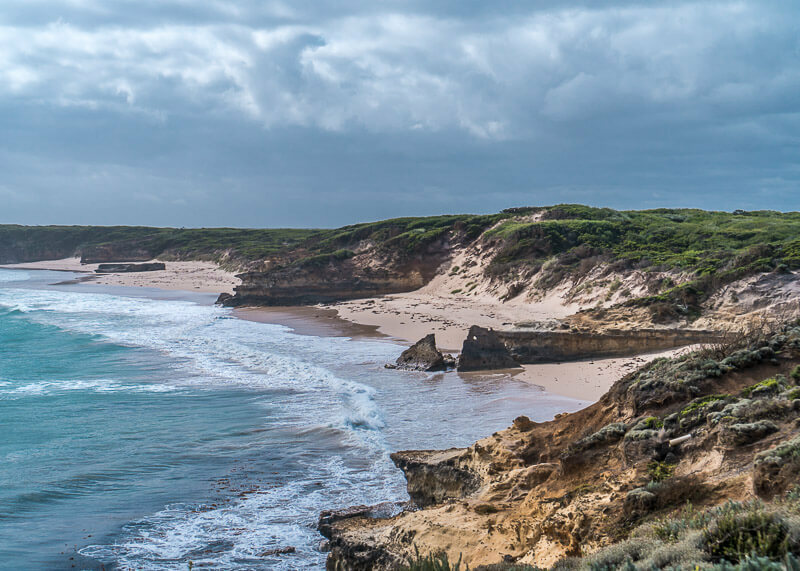 I recommend you read this comprehensive post about the Great Ocean Road Stops to learn more about the backstory in each location. 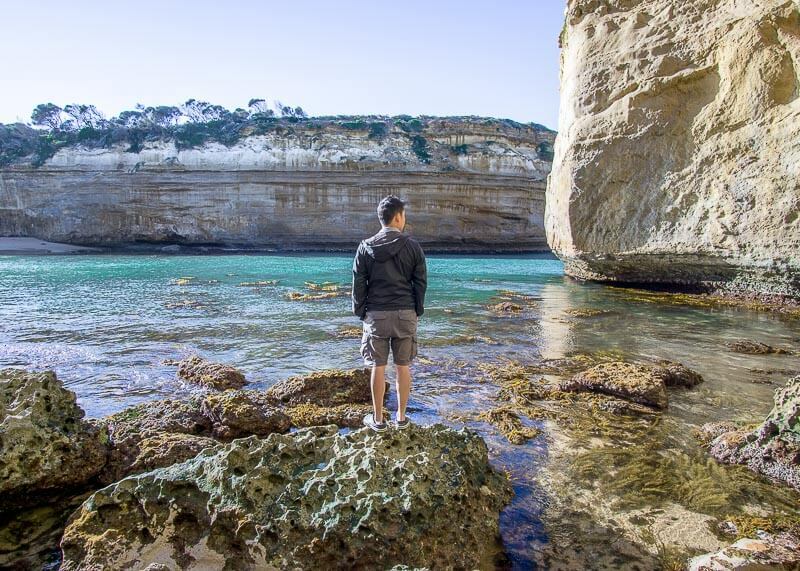 I woke up bright and early on the morning of our Great Ocean Road Tour from Melbourne. In fact, I didn’t sleep much all night before because of all the excitement. The pickup point was a twenty-minute walk from our hotel. Fortunately, we were able to leave our super big suitcase at our hotel and made our way to the pickup point at Discovery Melbourne Hostel with a carry-on. You’d think by now that I’d figure that we were doing a backpacker tour because we were being picked up at a hostel but…. nope…I was clueless as heck. Anyway, we made it ten minutes before the bus showed up and got on the bus only to realize that we wouldn’t be sitting together. Boo. Since we ended up with the remaining seats, G ended up sitting in the front next to some girl while I sat in the back with our bag of snacks to keep me company. What the heck? I start to get angry past the thirty-minute mark because I woke up super early just to sit and wait in the bus? Ugh. 50 minutes pass and our tour guide is still not here yet! Now I am insanely angry because I am tired and annoyed that we paid so much just to sit and wait. After waiting for so long, I decided to go into the hostel for a quick bio break since the next part of the journey is a long drive. As I walked out of a hostel, a lady claiming to be our tour guide walked out of the bus. She greeted me with cheery hellos and long apologies for being late. I responded with silence and hate rays coming from my eyes. I don’t care what excuse she has, I could have gotten some extra sleep instead of sitting for an hour waiting for her! She later told us that she got stuck in bad traffic and that the train network was down. Sounds reasonable, but I was still angry. But whatever, she starts to drive and I am relieved that the tour is finally happening. What’s unique about this tour is that the owner recognized the crappy experience when you are sharing a moment with too many tourists. He differentiated his company by building an itinerary that goes against the crowd. That meant we were to drive for three hours to Tower Hill Reserve and doing the Great Ocean Road Tour in reverse. Indeed, the drive is long but the time seemed to pass. Along the way, we passed by Mt. Elephant, the largest volcano in the area. It is due for eruption since the last one erupted about 5,000 years ago. The area is called Mt. Elephant because of the shape when viewed at a specific angle. I tried hard to see the elephant resemblance, but it looked like a dormant volcano to me. Our first pit stop happened right before lunch where the guide, Jude, served coffee and tea. She also collected payment and tried to get to know our names. She again apologized profusely for being late. Free coffee and tea made me feel a bit less resentful, but still angry for losing sleep for her tardiness. If you are lucky to be visiting during the wintertime, you get to see the whales nursing their young! 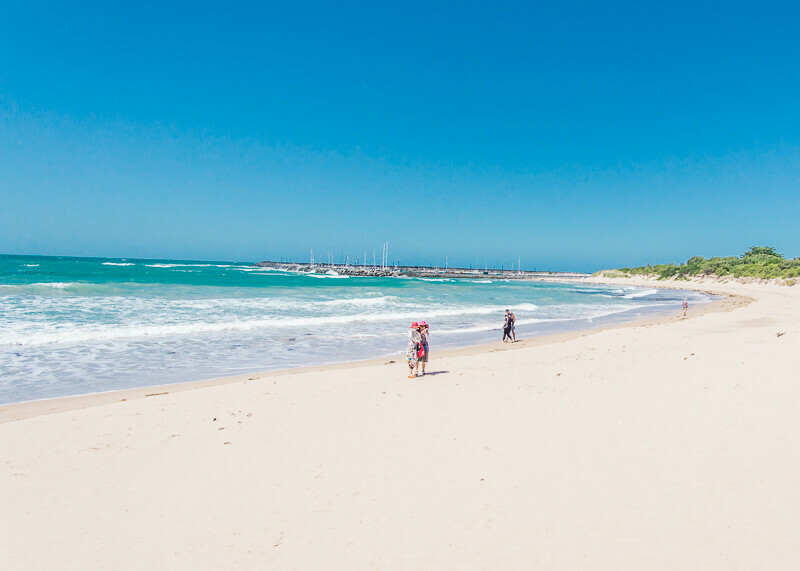 Our first stop was Logan’s beach, where you could spot whales from June to September. Unfortunately, there were no whales during that time to place sadly. I enjoyed all the stories that Jude shared with us along the way. Although I have to say, I was disappointed that we didn’t get to see any whales nursing their calves. Next was a 30-minute pit stop to grab groceries and lunch. It was nice to have this kind of stopover because we could buy any munchies we want from supermarkets. You think by now by watching her buy groceries to feed us that I figured we are on a backpackers’ tour, but nope, it didn’t clue into me at all. While waiting for the gang to eat lunch, we saw a crazy brawl happening right in the parking lot. One woman knocked the other down and punched her. The other woman started screaming and throwing stuff at her car. It sounded like they were fighting over a dude. Once we had some food in our bellies, it was time to visit Tower Hill. The area has many trees and plants thanks to its fertile lands. Another interesting thing is that there are no white swans in Australia and New Zealand, only black swans. It reminded me of my favourite book, the Black Swan where I learned about the black swan theory. 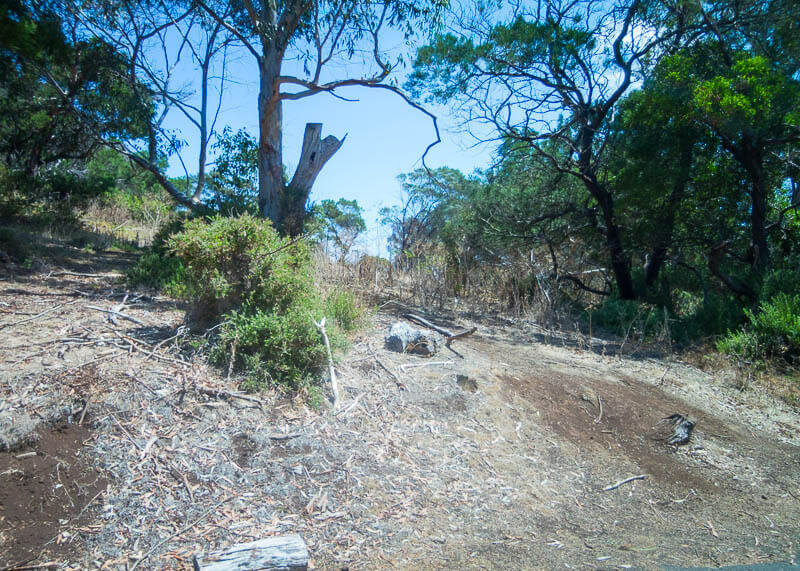 The Tower Hill Wildlife Reserve was fun – that’s where I spotted a koala bear, two emus, and three kangaroos. G was the first to spot the kangaroo that was lying in the shade. 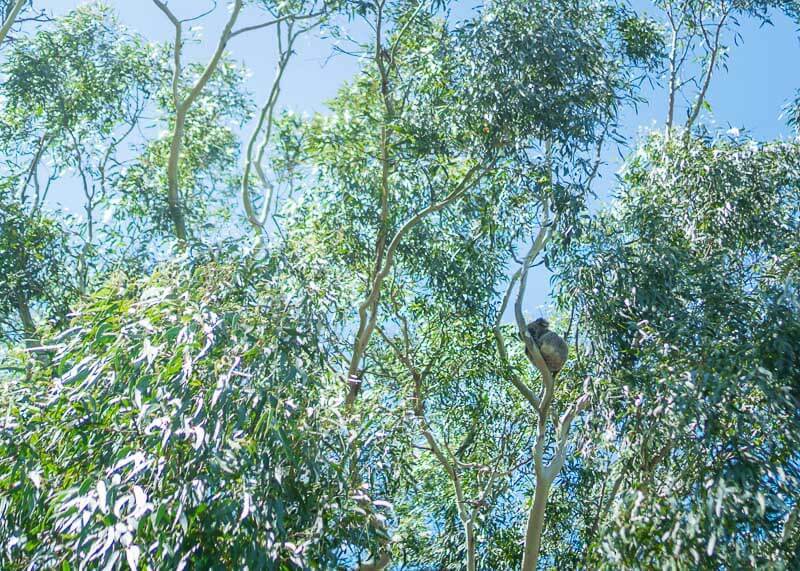 If you look closely, you’ll be able to spot koalas in trees! 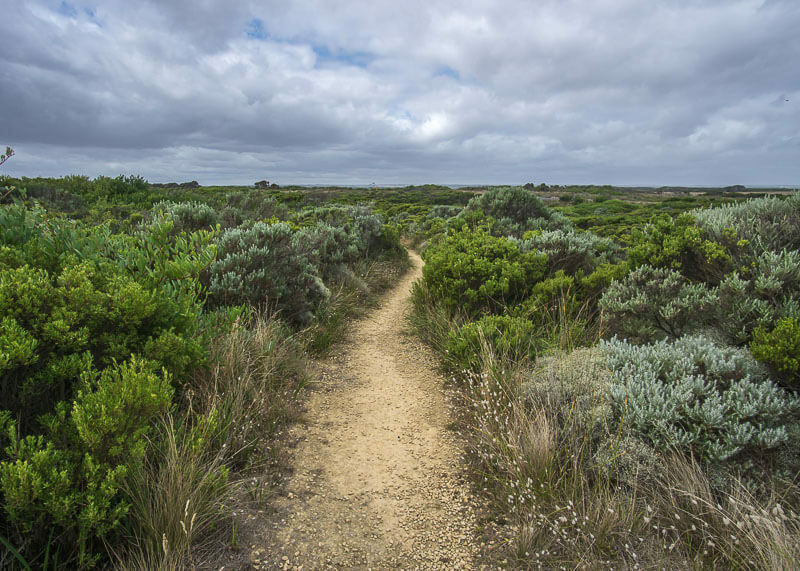 Tip: Take this path if you want to see kangaroos. Full disclaimer, I couldn’t figure out how to climb on this path properly, so I took the regular one instead. 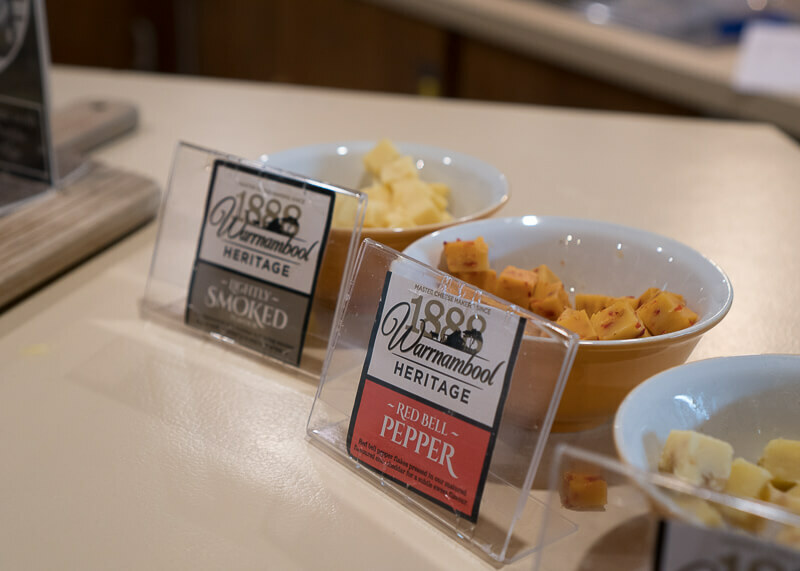 Our next stop was a very random cheese tour that left me feeling skeptical. But Jude kept telling us that we can sample cheese and make sure to use the bathroom since there are only bush toilets at the next few sites. Hmm…still skeptical (lack of sleep makes me so)…until I got to try unlimited cheese without being forced to buy anything. The ladies at the counter were also nice enough to fill my water bottle. 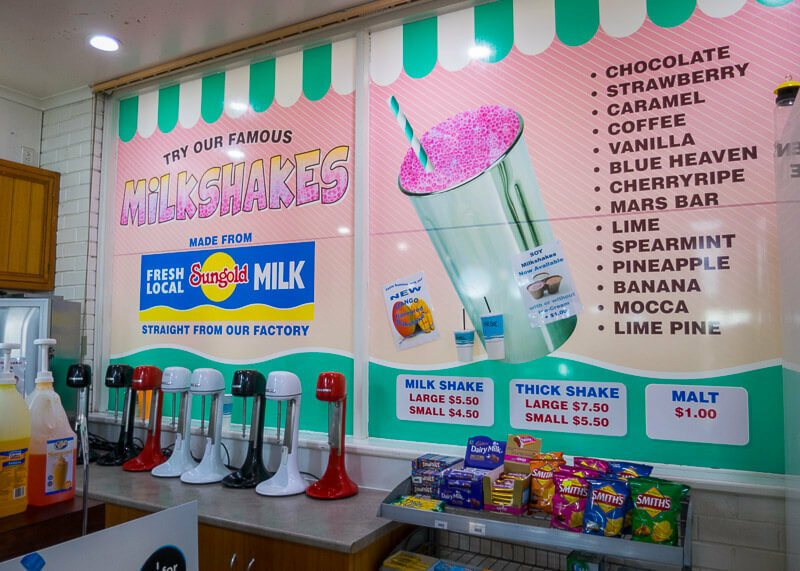 We also caved and bought their world famous milkshake (it’s worth it). 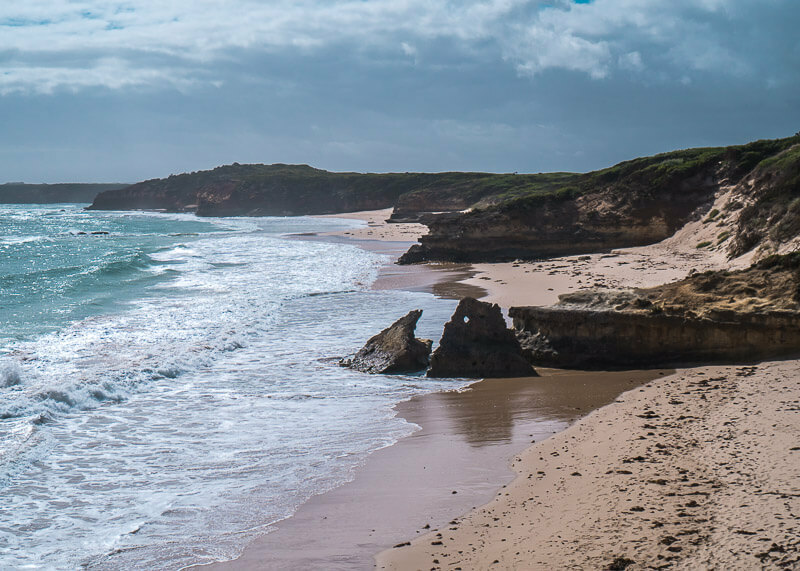 Next up was a section of Australia that is notoriously wild and known for its crazy weather. 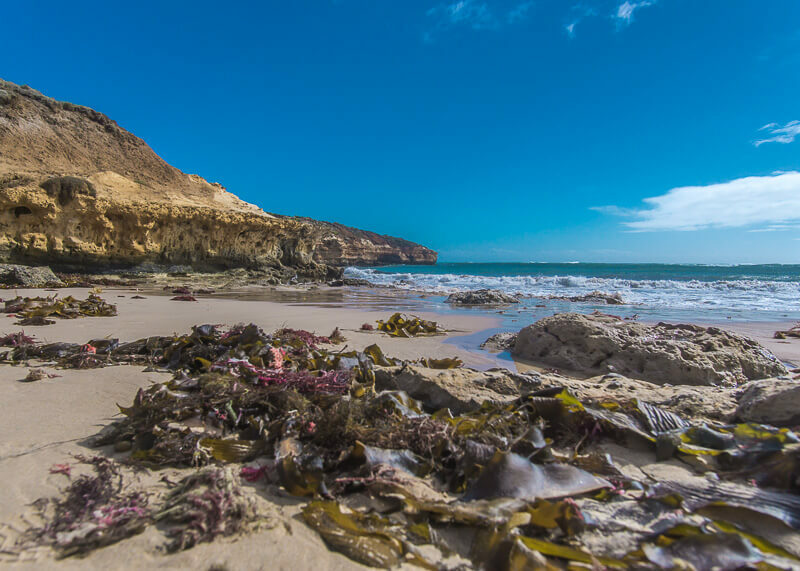 There are no islands on this coast, and so lots of shipwrecks happen. 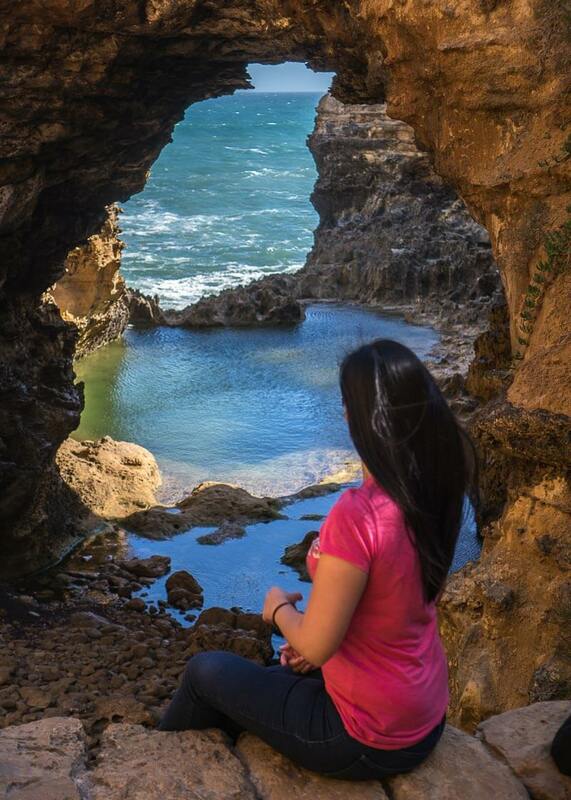 The Bay of Islands was stunning and breathtaking. It was extremely windy though, and I struggled to hold my hair so that it didn’t ruin the photo. We had 20 minutes to explore the area, which was enough time. This bay has a very tragic story. When the European settlers came to Australia, there was a clash between the two cultures. The natives fought back for over 20 years but to no avail. Their tribe ended when the European settlers pushed over 3,000 people off the cliff. By 1880, only a few hundred members of that tribe were left. This place was my favourite part of the tour. I wish we could have spent more time here, but we only had 30 minutes to get to the bottom. Had we done the drive on our own, I honestly could have sat here for at least an hour. Of course, people were trying to copy my shot and even pushed me out of the way. So annoying. How crazy is it that the central part of the arch collapsed with tourists standing on the arch? London Arch was once called the London Bridge. The name changed after one crazy day when the central part of the arch collapsed…with tourists standing on the arch! Fortunately, no one was injured. This site is the highlight of the trip and absolutely breathtaking. Stunning but super crowded. The sunset was beautiful. We learned that there were originally fourteen apostles but the names didn’t sound as clever. When they changed the name, the numbers of visitors exploded. In one year, this little town of 600 people sees two million visitors after the marketing name change. We also had the chance to see penguins go to their burrows at sunset, which was quite cool. 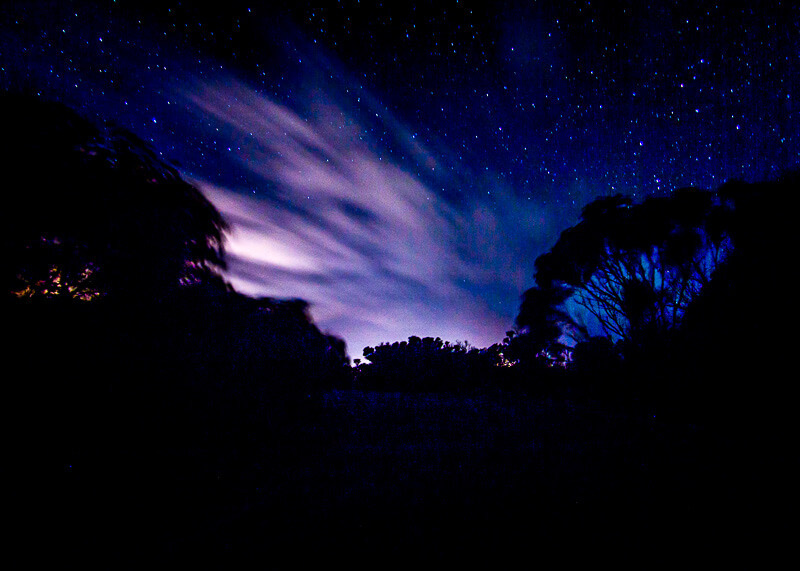 So many stars in the Australia night sky! The day was supposed to end after the Twelve Apostles, but Jude had a surprise for us. 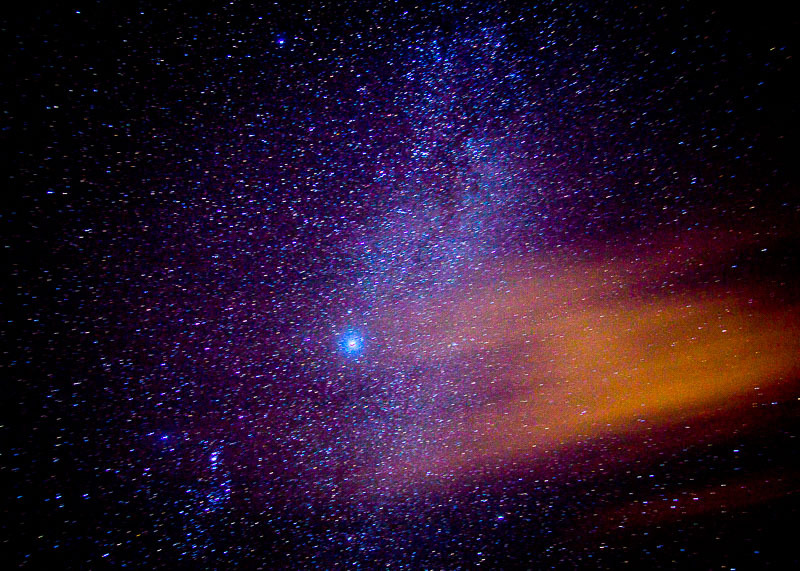 While we were watching the penguins, G had asked Jude if stars are visible in the sky. She said yes and offered to drive us outside of town into a little desert to make up for being late. Despite feeling extremely tired and wanting to head to bed, we couldn’t resist her offer. So we joined, along with two-thirds of our tour group. 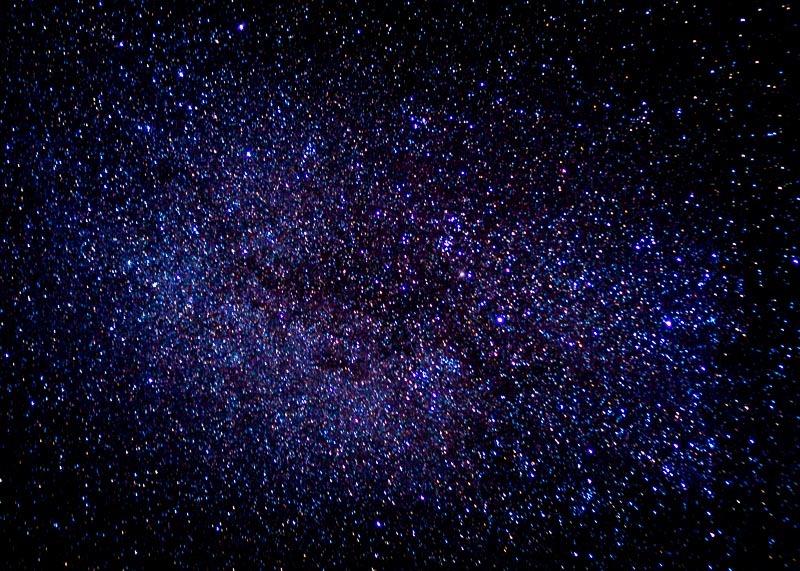 Staring at that night sky was a magical moment for me. I couldn’t believe that after all these years of dreaming about Australia, I was finally there. I couldn’t help but think about the dreams and wishes that were attached to Australia. They never materialized because it wasn’t meant to be. On the way back to the hotel, Jude shared stories about fun times with past tour groups. Because our tour was like, 90% Chinese, she tried to build rapport by speaking to us in Chinese. The funny thing was when she said “Gong hey fat choy” (wishing you great happiness and prosperity.” She didn’t expect a response and was stunned to hear our usual quiet group respond in unison with “Hong bao na lai” (red envelope please). Needless to say, we all appreciated her attempts to build rapport with us and had a night full of laughter. It was in that moment that I could no longer deny the truth – Jude is the BEST tour guide I’ve ever met. I woke up bright and early at 6 am to get ready for the second day. Actually, the question should be if I even slept? Because we booked the tour at the last minute, we couldn’t get a private room and shared a room with eight other people from our tour. Let’s just say only one person had a good night and probably couldn’t understand why his roommates were cranky. I swear, he hit every note and pitch in the musical scale through snoring. Anyway, the hostel stay turned out to be better than expected and I was ready for day two of the Great Ocean Road tour. 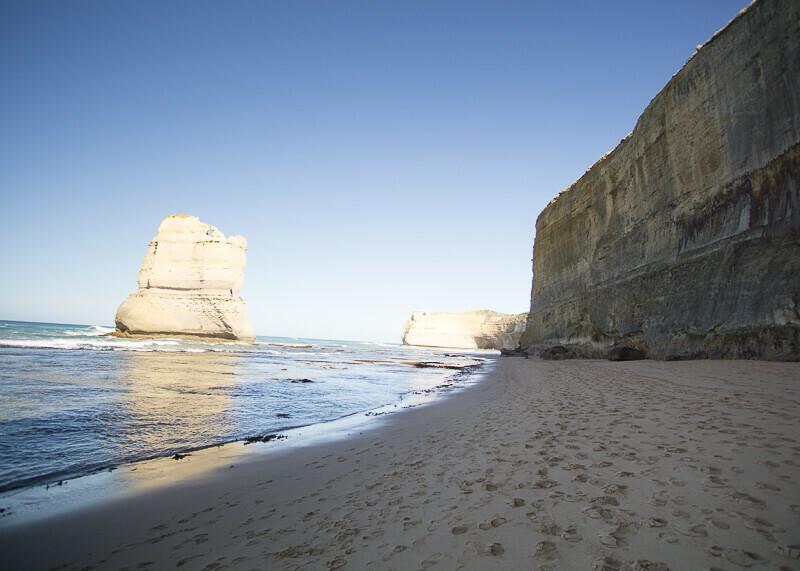 We went back to the Twelve Apostles during the daytime at 11 am for thirty minutes. It was not the same. 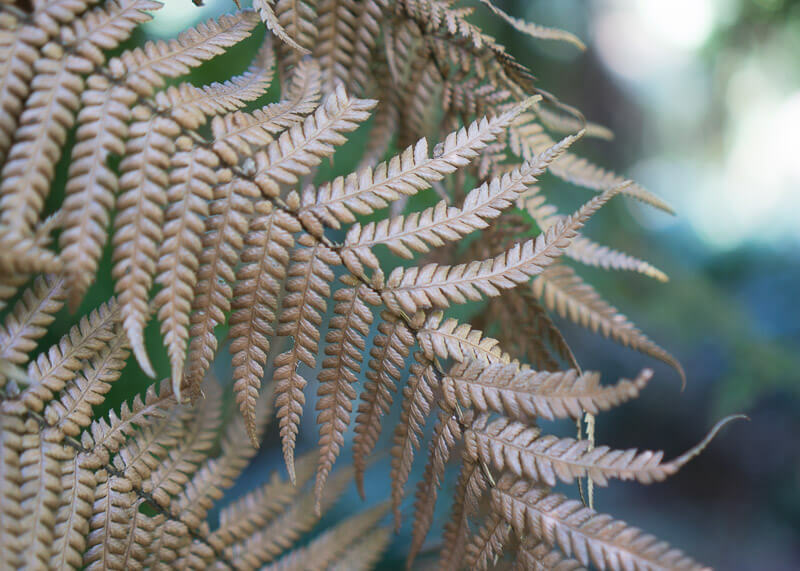 There was no golden glow from the sun. It was just hot and bright. We spent thirty minutes here but it was too sunny so I couldn’t take any nice photos. Jude mentioned that the steps are very steep and could be painful if you have knee issues. 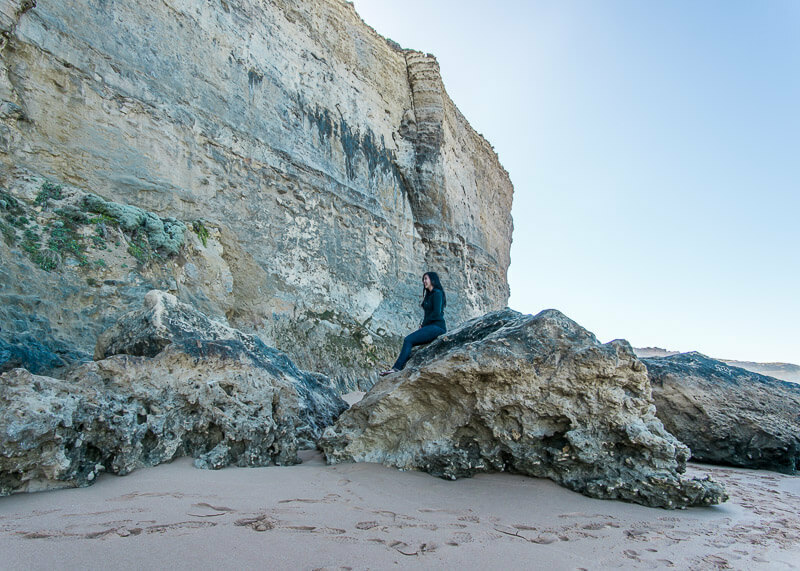 I enjoyed my time at Loch Ard Gorge and wished I had more time here. We spent 30-minutes doing a rainforest walk. While the scenery is what you’d expect from a rainforest, the highlight of this part was from the stories that Jude shared with us. She is such a great storyteller and cares about the environment. The food was not that good here – we blew our food budget out the window on mediocre food. 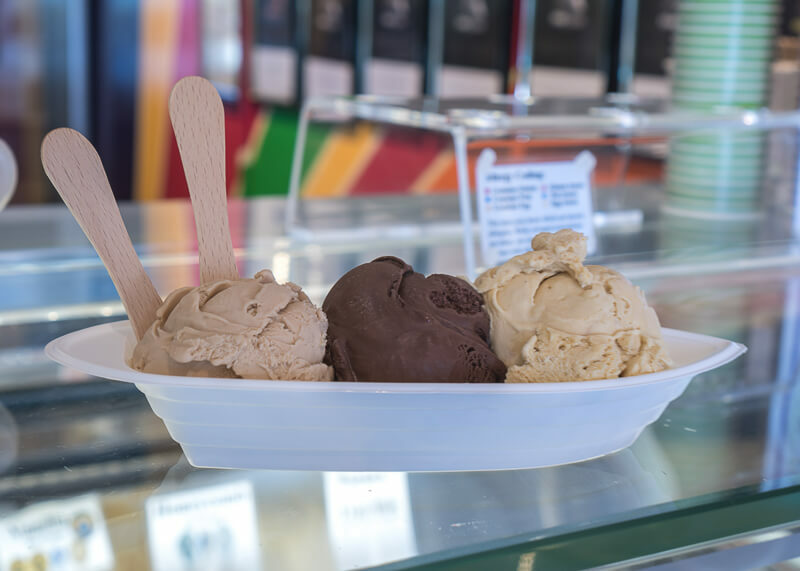 The fish and chips were ok, but the ice cream was delicious. 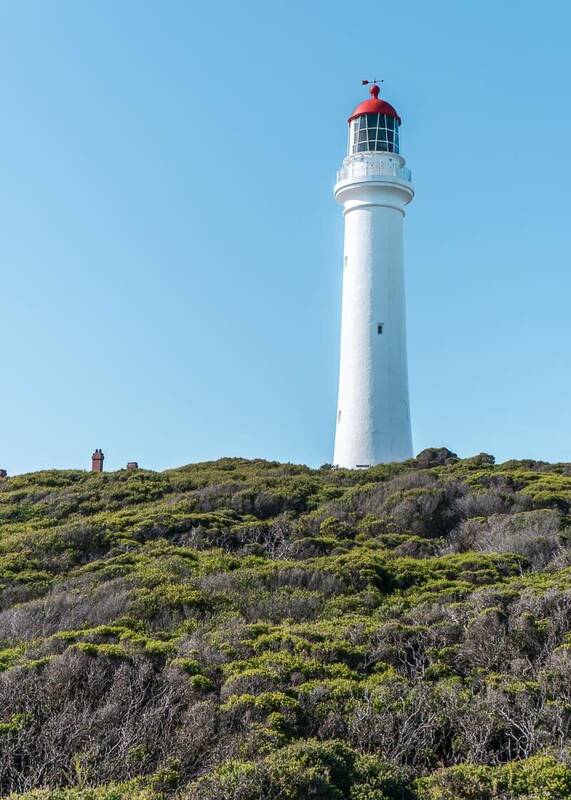 This lighthouse is from a famous show about a family who lived in the tower. Can you spot a tiny dog in this photo? We stopped by to have some tea and watched surfers ride the waves. I can’t imagine how awesome life must be to spend your day learning how to surf. 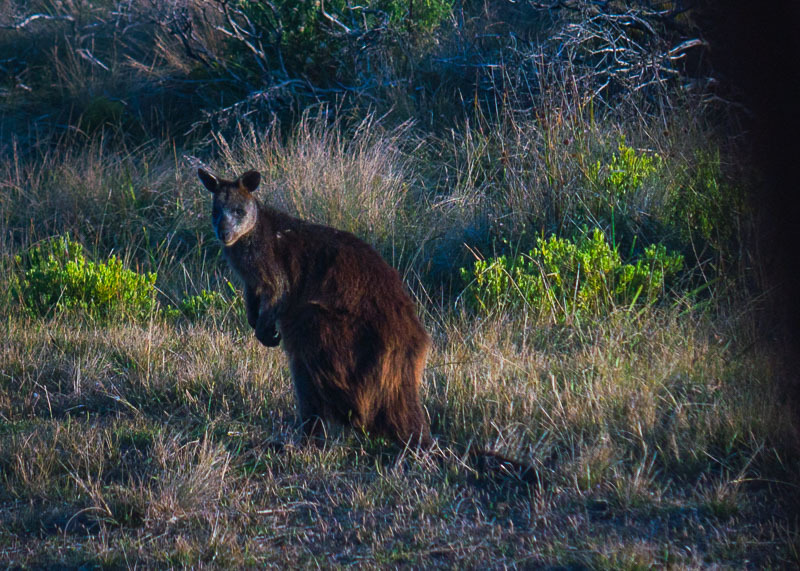 Honestly, I wanted nothing more than to see a kangaroo up close in the wildlife – that was my only wish on this trip. Jude thought we’d have our chance on our second day close to the end of the day. But sadly, the sky was not cloudy enough (apparently, kangaroos only come out when it’s less sunny) and she thought we wouldn’t be spotting kangaroos. But she told us not to lose hope and to keep our eyes open as she drove us back to Melbourne. And keep my eyes opened I did. I begged the Universe to let me see a kangaroo and stared intensely out the window. No kangaroos. It didn’t matter. I stared intensely until my eyes hurt. Only then did I see a creature hopping alongside our bus! “Kangaroo, kangaroo!” I screamed as loud as I could! Jude then slowed down and we found another kangaroo! 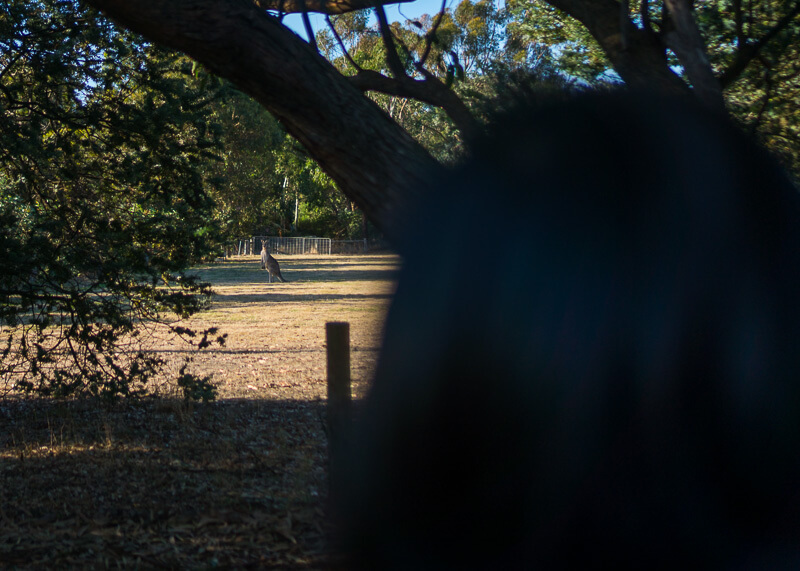 A spotted kangaroo in the distance! Then, as we were about to get onto the bus, we saw a FAMILY of kangaroos! 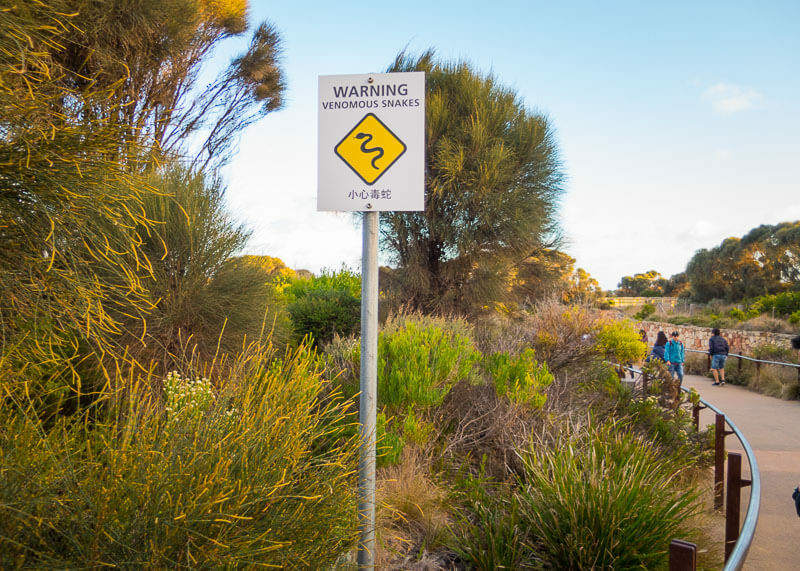 There are venomous snakes everywhere in Australia! Stay safe and be aware of wild animals…like snakes! Arrive at your pickup location a few minutes early and use the bathroom! If you love animals, try to see them in their natural habitat. If you are booking a tour that promises koala bear cuddling, run far far away! What’s It Like At The Best Western Plus Travel Inn Hotel Melbourne Why Port Campbell Hostel Along The Great Ocean Road Offers Incredible Value Don’t Miss These 14 Beautiful Great Ocean Road Stops Melbourne Travel Blog | A Look At The World’s Most Liveable City Life As Modern Nomads | Month Seven In Chiang Mai, Sydney And Melbourne What Being A Nomad Is Like In Australia & New Zealand Sydney Travel Blog | First Impressions Of Australia Sheraton On The Park Sydney Review | Should You Stay Here?